Development of the Silver Lake Trail has been in process since 2004. It builds off the existing half mile walking/biking trail in Perry, NY along the Silver Lake Outlet. 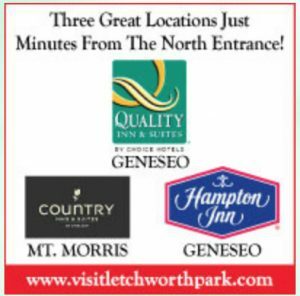 The goal of the SLT is to connect Silver Lake State Park to Letchworth State Park via Main Street Perry. While the trail is not officially complete, there are unique assets along the trail that visitors can enjoy everyday. Main Street Perry shopping district offers “downtown waterfront” located behind the “Festival Plaza” where the Perry Farmers’ Market operates on Saturday mornings throughout the Summer. The outlet walking trail is a flat walk through the woods and along the water. It is also the location of the “Pieces of Perry” en Plein Air art festival on September 16. Finally, the Village of Perry Public Beach on the East side of Silver Lake is municipal Lakefront property which is perfect for picnics, but also hosts the Shake on the Lake Shakespeare Festival August 3—August 5, this year performing Romeo and Juliet.